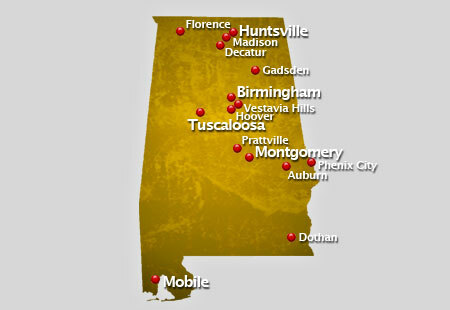 AirSign provides extensive aerial advertising coverage throughout all areas of Alabama. From beach aerial advertising to sporting events and over busy highways, we'll display your message to crowds in a way your audience will be certain to remember. Considered as the thirtieth largest state in the United States of America, the state of Alabama makes up a total area of 52,423 square miles, 3.19% of which is water. Geographically, Tennessee is bordering Alabama in the north, Florida in the south, Georgia in the east and in the west is the state of Mississippi. Three fifths of the total land area is a great plain, feasible for cotton plantation. History tells that settlers started with cotton plantations and expanded swiftly after the Civil War. In addition to that, profuse rainfall all through the year allows good harvest. Alabama has one of the hottest summer in the Unites States and mild winter every year. A few of the famous landmarks in Alabama are Fort Morgan, designated in the year 1960 in Baldwin and used in the battle of the Mobile Bay, and Fort Mitchell in Russell, symbolizing the three periods of interaction with the native Americans. The state also has accredited colleges and universities with different programs offered: 14 four-year public universities and two-year community colleges and 17 private universities. Among these good universities generate professional sportsmen in well-known league teams. Alabama has four Southern League Baseball Team and one Arena Football League Team. Crowds are an aerial advertiser's paradise! A typical flight over popular events or locations can result in as many as 8,000,000 impressions! Have us fly your aerial banner over the crowds in Alabama to put your message wherever you want, whenever you wish at the best value in mass marketing!